Potatoes, mayonnaise, a few chives . . . is that it? Potato salad is a familiar summer comfort food but it can get a little predictable. Make picnics and summer lunches in the garden a little more exciting by thinking outside the (salad) box. Reach for the radishes and hunt down the halloumi. Potato salad is the ballast in the summer cold lunch. Filling, tasty and reliable, it adds substance to the meal. Sometimes though, when it's difficult to defend against the charge of being boring, it might be time to look for a few off-the-wall additions to that salad. Cheese is a reasonable starting point, although you have to be careful. Robust cheddars are not suitable here. Instead you want something crumbly, salty and tangy. Feta is perfect, or, for those who like to keep their potato salad strictly British, a Wensleydale or Cheshire cheese does the job. Halloumi that has been lightly caramelised on a grill is another delicious possibility. Texture is an important consideration when livening up potato salad. Radishes are fresh-tasting and peppery, while nuts, especially toasted hazelnuts or walnuts can add crunch and flavour. For a hit of Italian anti-pasti flavour, marinated artichokes in olive oil and herbs go brilliantly with potato salad, while a handful of capers add a salty tang. American potato salad often comes with a generous helping of chopped meat or sausage. Tread warily if you head down this route. Some crispy bacon lardons can be welcome but anything more risks overkill. Also steer clear of diced vegetables and peas. That road leads you to Russian salad, another dish entirely. 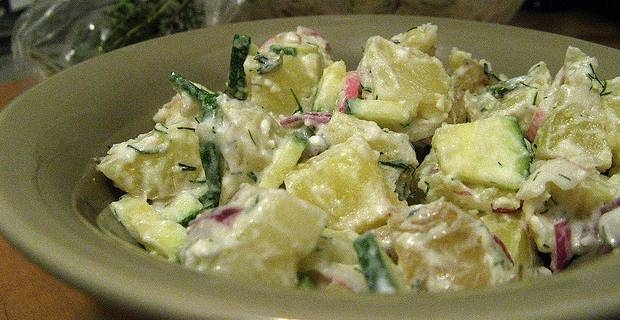 The health-conscious often like to make their potato salad with yoghurt rather than mayonnaise. If this is the case, it makes sense to use complementary additions like mint, cucumber or tahini to give a salad a flavour of the Eastern Mediterranean. Add a sprinkling of pomegranate seed for a fruity, astringent flavour and crunch.